It’s a podcast from the OSMcast in 2016! About… 2015! How exciting! So, we thought we were back, only we weren’t. Whoops! But we are here, with an episode. That we recorded all the way back in January! It’s the first half of the 2015 OSMawards, that now is in fact, the entirety. The 2014 OSMawards for most Awesome Video Games, TV Shows, and Movies. But in reverse order. Oh snap! It’s time for the 2014 OSMcast OSMawards! AKA the not so much awards, more like we just talk about the stuff we liked from the last year. Since last time we did it in the order of Video Games, then TV Shows, THEN Movies, we decided to switch things up! Into reverse order! So now it’s Movies, then TV Shows, and THEN a whole bunch of Video Games. Although we kind of start with a video game. But ignore that! Actually… Don’t. Don’t ignore that. We (and by we, we mean Basil) also complain about things that won’t let us give them money, and also not letting us give them the money on stuff we wanted them to! It’s a gas. First of, the OSMcast will be at Kami-con, covering the whole dang joint. Fun times shall be had! If you see us around (probably at the Hamacon table), come say hello! Lo and Behold we have returned. It is now the year of 2014. 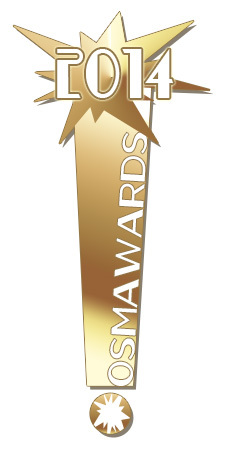 But 2013 had a lot of cool stuff in it, so we have brought back the OSMawards! In the first part of our two episode saga of days past, we tackle the staple that is Video Gaming. From 3DS, to PS3, to 3DS, to 360, to Wii U, to 3DS, to PS4, to 3DS, we cover all the game that tickled our 2013 fancies. We then venture into the realm of not-so Japanese TV Shows, then wrap up with Movies. We also talk about Space Dandy, fancy watches that tell you things, magical boards of water and ink, and more! So much more, including possibly the end of Doug’s never working freezer?! STAY TUNED. And now the most epic TIME CUES we have ever done! According to Lee: "The blue lines aren't because I drew it on notebook paper. They are in fact the enemy robot's barrier shield that the OSMrobo is ripping through." As we all know, the first thing you do in a new year is to look back at the previous year, unless you have a decade to deal with. So to ring in 2011 we have got the first half of the 2010 OSMawards! In this just-shy-of-two-hours BEHEMOTH of a podcast we tackle the “passive” media of 2010. TV shows, movies, anime, novels, stuff you consume but don’t interact with… pretty much everything expect video games. So strap in, get some nice hot cocoa a warmin’, and listen to us yammer for a while! 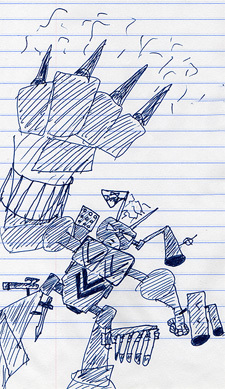 Bonus: And gaze up the MAJESTY that is OSMrobo that Lee drew while recording. His fists are fists of JUSTICE. And awesomeness. Bonus props to Narutaki of Reverse Thieves for rising to the challenge letting us know her picks via Twitter to help us fill in the gaps! If you’s also like to your thoughts in on a particular subject before we record, just keep an eye out for Basil’s twitter feed. Usually the day of recording or so, he’ll be asking for input. Speaking of asking for input, Basil was invited onto the Chainsaw Buffet podcast to further talk about the year 2010, which he did with gusto. Keep an eye for it!